I like it a lot. Honestly the first time I tried to watch it, I didn't past the first episode. After deciding to give it another try, I enjoy that comedy and simplicity of the anime. I have not read the manga, but I would have liked a little bit faster development of the story. Is a great anime to watch if you want a little break and view stories that probably will take you to the past. Hope some day a Season 2 is released. When it comes to Tsundere Children, the only thing that keeps it from being too bad is that it accurately depicts real relationships, at least more than most romanticized stories. It deals with the awkwardness of being in a relationship to the awkwardness of being around someone you like. It also shows the bad sides of dating, (fights, breaking up, apologizing, misunderstandings) and does it in a way that feels real. Unfortunately, each episode is only 11:30 after the intro and each episode is broken into parts that showcase a different love story. The stories continue on in that fashion throughout the series which makes it less investing because the stories are interrupting each other. This story is incredible. Young people trying to understand love. Really enjoyed this show and would recommend to anyone over 12 years old. Show proved it was amazing because after every episode I felt sad that it was over. I enjoyed every episode and the episodes felt long. It was spectacular. The characters were of every "group". Cool/popular, nerdy, smart, shy/quiet, and quirky. Cannot describe in words how adorable this show is. A crash course in shoujo anime tropes. This is based on a series of 4 panel comic strips. So each episode is broken up into several small bits. Each deals with one issue between two characters briefly before moving onto the next. In some ways, this is a breath of fresh air for a seasoned anime fan. Things actually happen, people say things and the plot moves forward. Who knew that could work? It's also well animated. But nothing really new is added. This is all the same tropes you've seen a hundred times, played in a narrative time lapse. Verbal misunderstandings, fear of intimacy, annoying little sisters, it's all here. As a cliff notes version of shoujo to show to an anime newbie, it could work out. But if you've seen those shows before, you're likely looking for more. A heart warming experience even for the coldest of hearts. Tsuredure Children is the most heart warming series I have ever seen. Going into it you have no idea how things will turn out for each couple/crush. Some take a very long time to progress while others bloom and progress right off the bat. If you are looking for a reason to cry, a reason to smile, or a reason to laugh I recommend this anime to you. A amazing anime its a must see! I enjoyed watching this anime it has really amazing characters and depicts about how things can be hard when in comes to relationships at the end of the anime it touched me and i wish they would release season 2. I still want to see the continuation of every single characters and how they all bond when it comes to relationships. This hits the nail on the head when it comes to dating and relationships, especially in high school. All the inadequacies, all the situations, all the feels. This anime is great. There isn't any filler, and the episodes only go as long as they need to. Rather than stretching things out to be thirty minutes per episode, it keeps it short and sweet. It hits all the points and creates just the right amount of emotional connection to the characters. I felt for every character in this anime. All the tears, all the joy, all the awkward moments and heart skipping beats. This anime is a work of art, and deserves this 5 star rating! I want another season! this anime really sent me into high school. all the emotions, all the hardship, all the weird emotional dodging, it really hit me hard. so many different circumstances, and i could relate with each and every one of the characters. i love this anime and i really want more episodes!! #94. Short, simple, and sweet. How a romcom should be. 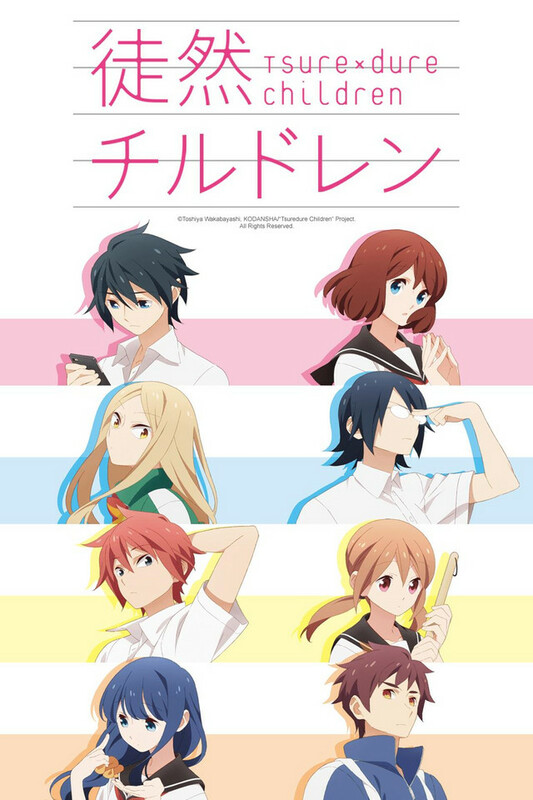 Tsuredure Children is one of the best romantic comedies I have seen, it's also one of the best short form anime I have seen. The anime follows multiple pairs of couples, wanna be couples, almost couples, cute couples, funny couples, you name it. There's not much of a description here because of the show’s all over the place nature, however this show’s greatest strength is the fact that the episodes are twelve minutes long. This is a anime that really strengthens the fact that great things can come in small packages, this is a show I can recommend to everyone, for its cute, quirky and funny characters trying to tell each other their feelings. It essentially takes the more key moments in relationships for many of it's couples and bundles them together in a compilation of cuteness! At first I was kinda "meh". Then cuteness overload got to me. This suprised me a lot, I was expecting something a tad weird, well... I got that, but that is not really a bad thing. I wasen't super invested before the 2nd episode, and at that point I rewatched the 1st one and binged it. Just a massive cast of super cute and akward characters that you end up loving... Though, that "Yuuga Aoyama" was a bit... Meh for me personally. When I came over that character I more or less started to skip parts, but the rest is so fantastic that it is worth your time to just watch it. If you want cute characters that fall in love, here you go, though I wished personally for some more fleshed out parts for some characters, felt the spotlight were too much on one group, instead of spreading it out better. And after the last episode, I REALLY want another season to see how their relationships develop, there are characters that still didn't get any real conclusion to their stories, wish is something I wish for.